First Lady to McGlothen Temple Church of God in Christ for 22 years, from 1964 - 1986. 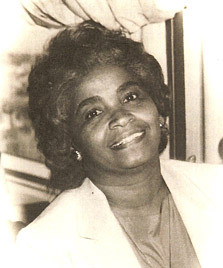 Mother Gladys Davis was affectionately known by all who knew her as "Gladys". She was a lifetime member of the McGlothen Temple Church of God in Christ. She had a special love for young people of all ages. The Sunday School Children's Class and Vacation Bible School flourished under her leadership and guidance. For many years she would fill her car to capacity to ensure they could attend Sunday School and Vacation Bible School. She served the church in numerous capacities, such as First Lady of California Northwest Jurisdiction and the McGlothen Temple Church of God in Christ, CNW Chairperson of the Women's Finance Department and Hospitality Department. She also served as Choir Mother for the Voices of McGlothen Temple, Member of the Women's Day Finance Department, Vacation Bible School Coordinator and Christian Women's Council President. She worked for numerous years with Mother McGlothen on the Executive Hospitality. She also organized the McGlothen Temple Sunday School Choir which was later renamed the Bishop Clarence James Davis Memorial Choir. Mother Davis was a "true" role model for women of all ages. The young women loved to be in her presence and would often be found in her home after church on Sundays and Friday nights. She believed and rigorously taught Titus 2. She taught the women how to be excellent Wives, Mothers and homemakers. She admonished them to always be at their best. She always told them how important it was to love and respect God and their husbands. Gladys was an avid chef and some of most enjoyable times were spent preparing meals. The doors of her home were always open for visiting Preachers, Missionaries and the Saints of God. She welcomed them with open arms and a delicious home cooked meal. She was a lover of people and never met a stranger. She was a friend to all and one always felt welcome when coming into her presence. She worked for Safeway Grocery Stores for many years and also aided in many of McGlothen Temple's members also becoming employees. She retired from Safeway to become a full time Wife, Mother and First Lady. She was called to her heavenly home on January 4, 2008.